Apr 10 Our team performed inspection and water tested with the customer present. We explained to her that both her old system and her neighbors systems were installed incorrectly. Gutters in Florida are hung under the drip edge, not over and through it like her neighbor stated and her marketing materials showed. Water test showed system pitched properly. We left the service call with the customer satisfied. If there are any additional comments, our service and support team is available at 800-749-4566. I have contacted Customer Service and talked to managers since March 29. I can't believe how badly things have gone. The lack of concern and downright hostility from the "managers" is shocking. No follow-up and promises continue to be broken. Only bright point was Heather who answered the Customer Service line. She was always friendly but Efran, Rod, and Ronny were disrespectful and mocking. Ronny promised (on 4/3) a crew would come by Thursday or Friday. Waited around the house both days. No phone call and a no show from a crew. After numerous calls, no response. My check was cashed right away even though I asked it be held until we resolved the problem. Your website and promotional materials show the gutters hung right under the roof. My front gutter and long back gutter are hung inches below the roof line. I couldn't see how low they were until later after they left when I hauled my 70 year old body up on a ladder. I realize Leaf Filter doesn't want to spend the time and energy on re-doing or at the very least, check on this, but I will not give up on trying to get this resolved. 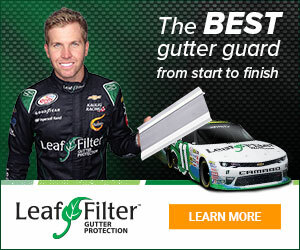 Product or Service Mentioned: Leaffilter North Gutter Installation. Review #1509592 is a subjective opinion of AheadOstrich950.